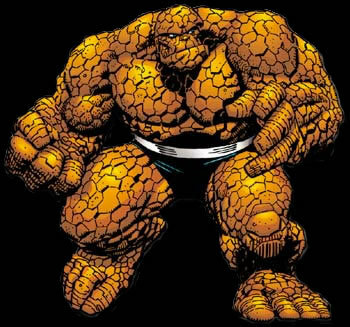 Physical Description Drass has chiseled features and the surface of his body is covered in rough, crystal like facets, giving him a distinct rock-like appearance (picture the Thing from the Fantastic Four). His skin, while once having been similar to sandstone in color and texture, is now a dark bronze with a distinct metallic texture after having been caught in an anti-matter implosion. He's larger and stronger than most other Brikar, Starfleet Medical believes this is because he has spent his entire life in Earth standard gravity, opposed to his home world's low gravity environment. He's squarish in stature and has small all-black eyes, two vertical slits for a nose, a simple slit for a mouth, and two small circular ear holes on either side of his proportionally small and compact head. Finally, he has three-fingered hands with an opposable thumb. Drass is incredibly strong, even by Brikar standards, capable of lifting several tons with ease. His large size makes him slow and somewhat clumsy, especially in small, cramped, and/or crowded environments. Despite this, he is capable of bursts of impressive speed and agility. Like the rest of his race, his thick, crystalline hide is highly resistant to energy, projectile, and melee weapons, earning him the nickname "The Juggernaut" during his time at the Academy. He is, however, unusually susceptible to the low power stun settings on most energy weapons and sonic based weapons; and slow to heal when he is injured. General Overview Drass is a kind and compassionate individual who always puts the safety of others before his own safety. To those who don't know him, he can come off as gruff and distant, even a bit crass. He is extremely loyal and will readily jump to the defense of his friends (which lead too many a bar fight during his time at the Academy). While he dislikes conflict, he is not above using violence, but always makes it a point to never start a fight. He simply finishes them. Drass is rather shy, especially in off duty social situations. However, because of the renowned Brikarian stoicism, he comes of as gruff and distance, as previously mentioned. He has a good sense of character and a sarcastic sense of humor. Unlike most other Brikar, he lacks the usual prejudice toward Klingons, having been raised outside of that society. That said, most Klingons don't bother asking his feelings on the subject and just assume he is like all other Brikar. So, in general, his previous dealings with Klingons usually ended with a fight. Drass' Academy psychological evaluation indicated that he suffers from mild claustrophobia. While treatment was offered, Drass refused to acknowledge even the possibility that he had claustrophobia, much less needed treatment for it. For this reason, it is recommended that he be kept under close observation during any extended service aboard a starship. Ambitions Drass has aspirations to one day become the Chief of Security of a Starbase or Deep Space installation. Languages Drass is fluent in all major and most minor Federation trade languages. Personal History Drass was born to Koss and Dona Kebron while they were stationed at Deep Space 5. As a young child Drass spent most of his time while not in class alone, as the other children on the station generally avoided him. This didn't seem to bother him, since he spent most of his free time reading, fishing on the holo-deck, or listening to the stories told by various travelers as they passed through the station. When he was ten he was given a job by a freighter captain moving freight on and off the ship. While working on the freighter, be met a young Andorian orphan that the captain had "adopted" named Nomiko. The two became fast friends and would later attend Starfleet Academy together. At the age of 18, Drass was accepted to Starfleet Academy after two years attending the University of Illinois. He chose to follow in the footsteps of his parents, double majoring in Security/Tactical and Engineering. His time at the Academy was fairly uneventful, save for one incident. While on a routine training mission, Drass' away team encountered a group of Jem'Hadar soldiers. Caught by surprise, several members of the away team where injured by the Jem'Hadar's opening volley. In an attempt to draw the fire away from the rest of the away team, Drass charged the Dominion force's position. The Jem'Hadar opened fire on Drass, only to find that their weapons left only small craters in his hide. Upon reaching the Jem'Harad's position, he engaged in hand to hand combat, using his size and strength advantage to hold the Jem'Hadar off until reinforcements arrived. Afterwards, he spent two weeks in sickbay recovering from his injuries. The away team's commanding officer, in his official report, referred to Drass as "a juggernaut" during his reckless charge of the enemy position, thus earning him the nickname "The Juggernaut". After graduating from Starfleet Academy, Drass was stationed at Starfleet Headquarters for six months before being transferred to the Zealous. Service Record Drass has been fully trained in all aspects of security/tactical, including rigorous flight training, and engineering. While proficient with all Starfleet weapons, he specializes in close quarters and hand to hand combat. He is highly skilled with many bladed weapons, including the katana, bat'leth, and mek'leth. Despite passing his engineering certification boards with flying colors, he opted for a position in Security, following in his father's footsteps. During the Dominion War, in order to produce trained crews faster, Starfleet Academy cut back on inter-discipline training. Thus, Drass took only the basic courses necessary in navigation, science, ops, and medical. Now that the war is over, he hopes to broaden his training, esp. in the area of science, but has yet to do so.